A demonstration or expression, or a supernatural appearance and show of power. Summary: Sin broke the perfect bond of communication between God and humanity. But God continues to speak to us through His prophets. The concept of spiritual gifts is shrouded in mystery. For many, spiritual gifts are one of the most fundamental parts of their faith. The charismatic movement, for example, makes the gift of tongues one of the most important signs of salvation and a relationship with Christ. Many say that if you do not speak in tongues, your relationship with Christ isn't fully established. Spiritual gifts are listed by Paul several times in Scripture, and we will focus on unpacking his writings to the Church in Corinth (1 Corinthians 12-14). Although Paul’s first letter to the Corinthians was written 2000 years ago, it is full of relevant lessons for today’s Church. Here we learn important information about the Holy Spirit, the gifts He gives us, and how we are to use them. When God warned the ancient world of the coming judgment, He used prophets. For example, in the time of the Exodus, God used Moses to lead the people out of Egypt to Canaan. The testimony of Jesus is the spirit of prophecy (Revelation 19:10 NKJV). God's remnant must thus possess the Spirit of Prophecy in order to qualify as the remnant. There is nothing more dangerous to Satan than the clear revelation of God's will, which is why Satan tries to cast doubt on or counterfeit God's truths. It is therefore vital that we understand the Biblical criteria for the manifestation of the gift of prophecy, and that we understand the reasons why God grants this gift in the first place, so that we will not be swept away by Satan's deceptions. The following articles are to help you understand the issues involved so you will not be deceived. When Adam and Eve sinned, their first impulse was to hide themselves from God (Genesis 3:8). They hid because they recognized their nakedness. When God called Adam, Adam answered, "I heard thy voice in the garden, and I was afraid because I was naked; and I hid myself" (Genesis 3:10). Adam and Eve were stripped of their cloak of righteousness and stood naked before God. Sin caused a separation between God and humankind (Isaiah 59:2), and only in Christ are we reconciled to God. "For if, when we were enemies, we were reconciled to God by the death of his Son, much more, being reconciled, we shall be saved by his life" (Romans 5:10). The message of reconciliation has been entrusted to the Church—to the Old Testament Church in type, and the New Testament Church in truth. And all things are of God, who hath reconciled us to himself by Jesus Christ, and hath given to us the ministry of reconciliation; To wit, that God was in Christ, reconciling the world unto himself, not imputing their trespasses unto them; and hath committed unto us the word of reconciliation. Now then we are ambassadors for Christ, as though God did beseech you by us: we pray you in Christ's stead, be ye reconciled to God (2 Corinthians 5:18-20). In Christ we are reconciled with God. But as long as sin exists, face-to-face communication with God is not possible. The brightness of His glory would consume us. Whenever God has revealed Himself to humans, it was either in a dream or God veiled His glory. 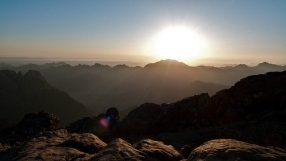 When God spoke to Israel from Mount Sinai, He warned them that they would die if they came too close. The presence of God, although veiled in thick clouds, was so impressive that the people requested Moses to speak to them the words of God, lest they should die from the voice of God (Exodus 20:19). Even in vision, the prophets felt that they would die in the presence of God. So I said, 'Woe is me, for I am undone! Because I am a man of unclean lips, And I dwell in the midst of people of unclean lips; for my eyes have seen the King, The LORD of hosts (Isaiah 6:5 NKJV). In New Testament times, the situation was no different. When John saw Jesus in vision, he fell as dead (Revelation 1:17). One day it will be possible again to stand before God and speak to Him face to face, "For now we see in a mirror, dimly, but then face to face: Now I know in part, but then I shall know just as I also am known" (1 Corinthians 13:12 NKJV). Our communication is hindered, but it will be restored. "For we know in part and we prophesy in part: But when that which is perfect has come, then that which is in part will be done away" (1 Corinthians 13:9-10 NKJV).